So, allow me to present the Offshore Professional Field Engineer no. 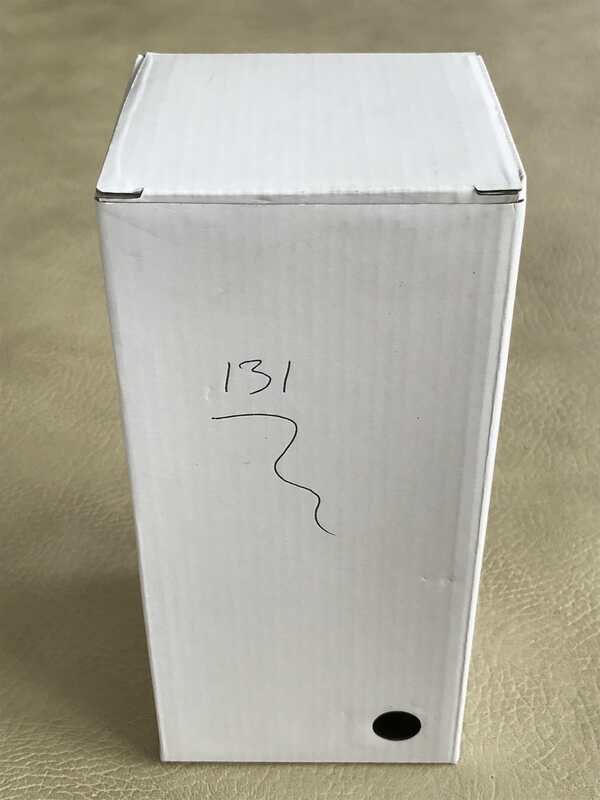 131, built by Classic Chronographs Ltd. Yesterday afternoon I drove over to The Clock Gallery in Ealing and collected my brand-new FE from Darius, the watchmaker who actually builds them. Opening the box presents you with a splendid 2-watch leather roll, beginning to suggest that there might be something rather lovely inside. 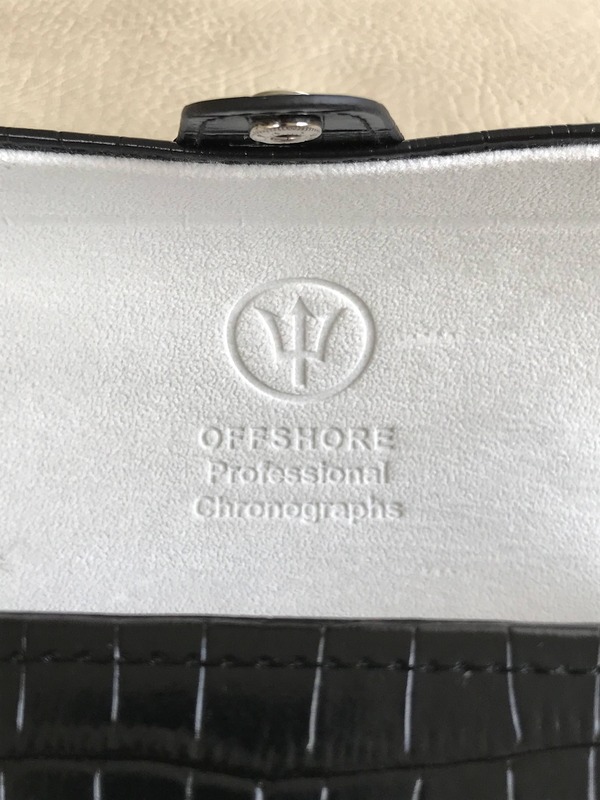 The inside of the box is nicely lined, and the logo + ‘Offshore Professional Chronographs’ stamped into the inside of the box top is a nice touch. Of course, what we’re really waiting for is to see the watch itself. 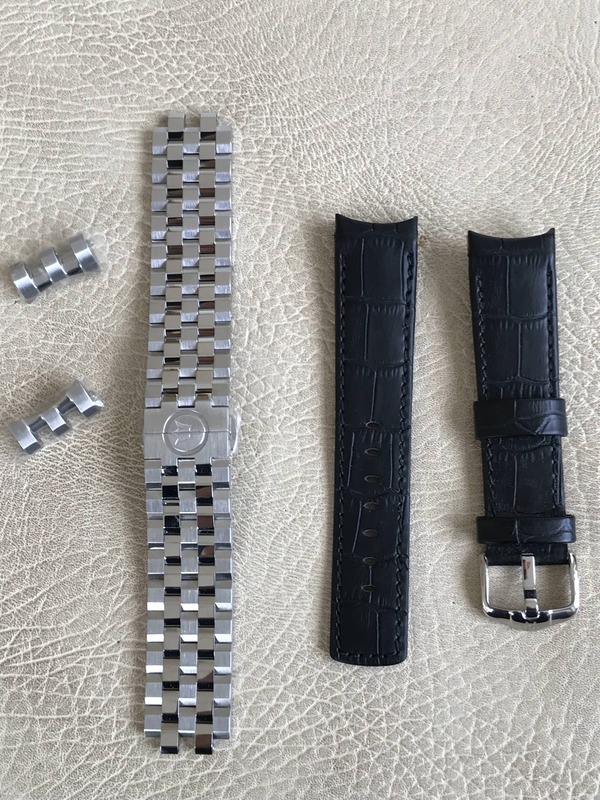 These are the two straps that come with the watch as standard, the black leather curved end strap (wearing the Hirsch buckle that came off my supplied strap), and the excellent quality ‘Engineer’-style steel bracelet. So I guess the obvious question is… after all the anticipation, does it live up to expectations? 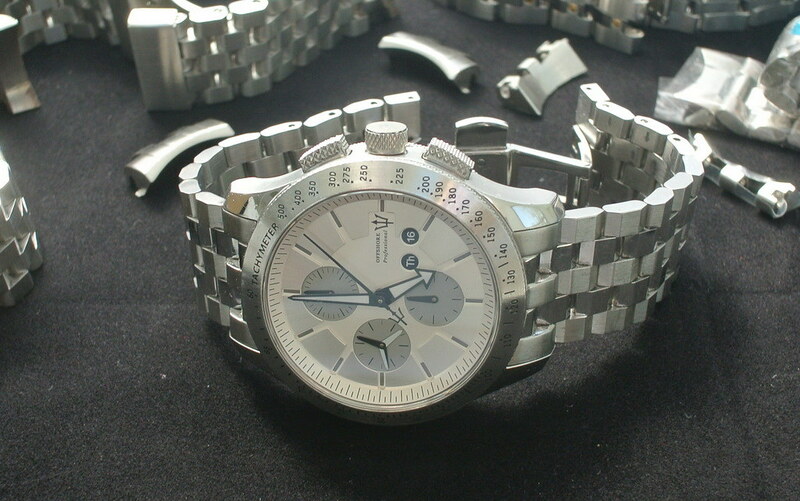 I own some very nice watches – three Breitlings, an Omega and a Doxa amongst them. I know what good quality looks like, and by any standards this is a watch that punches well above its weight. 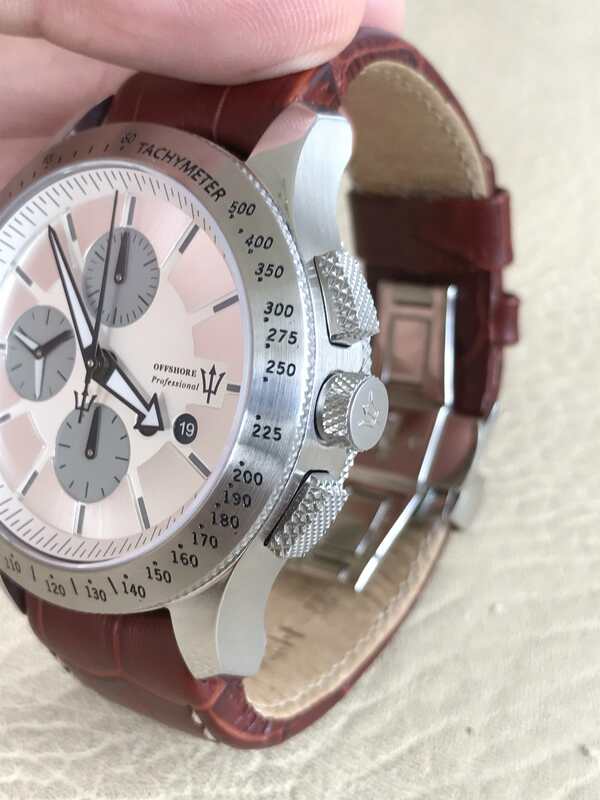 •The different textures and surfacing on the dial are very clever. They avoid large flat one-dimensional areas and draw the eye to different elements of the design. 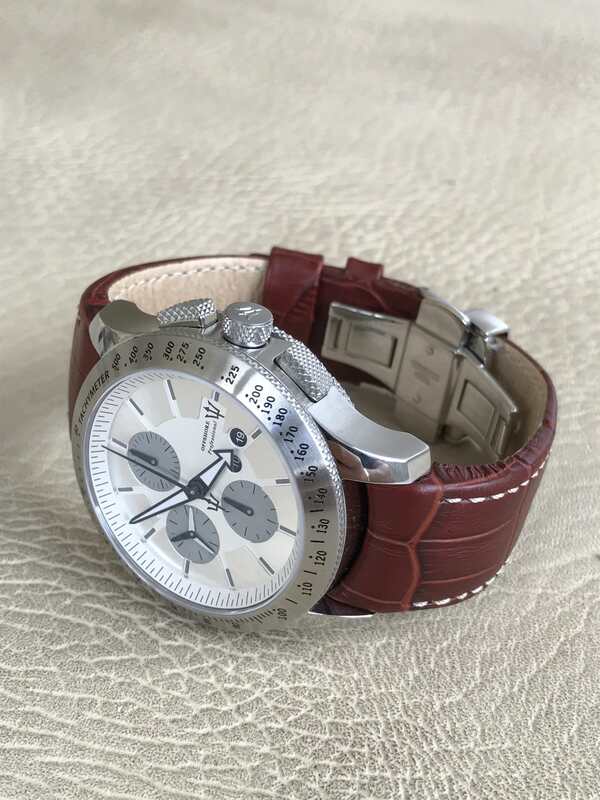 The dial is also a very subtle mix of colours, incorporating cream and silver with grey sub-dials. 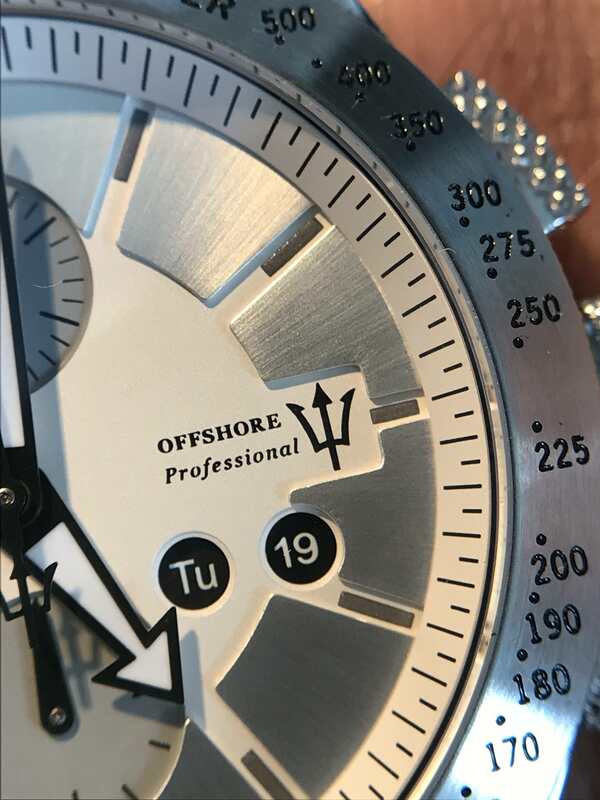 •It’s very easy to read, I love the ‘propellor’ second hand and the trident on the chronograph hand is really well executed. •The case is superbly finished with brushed sides and polished top surfaces on the lugs. Very substantial and a great size. Short downturned lugs help to shape the case to your wrist. 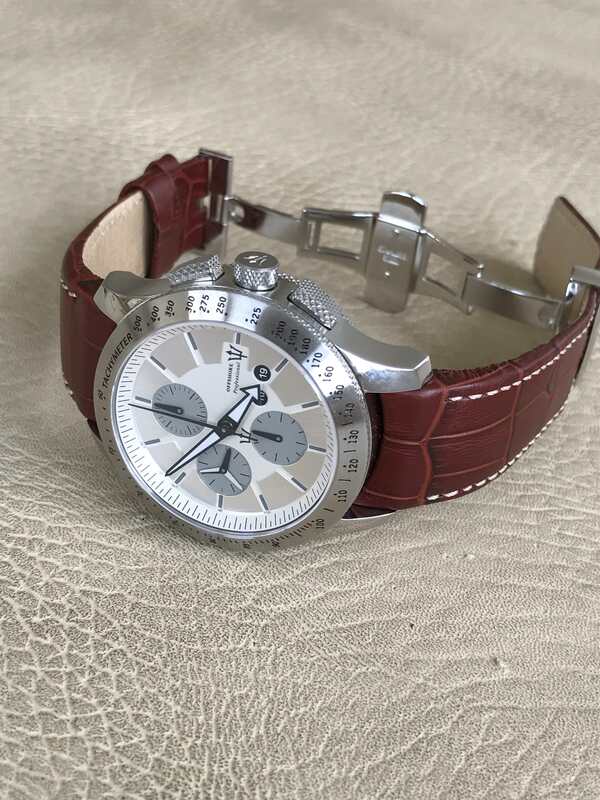 •The tachymeter bezel works brilliantly with the overall design. •I really love the separated treatment of the day and date – I think combined day/date windows often look incredibly clumsy; two separate circular windows avoid that completely. •Both crystals are completely flat and the view looks great front and back. The serial number engraved onto the rotor is one of many nice touches. From a functional perspective, the movement is an upgraded version of the 7750, so it’s a known reliable engine. 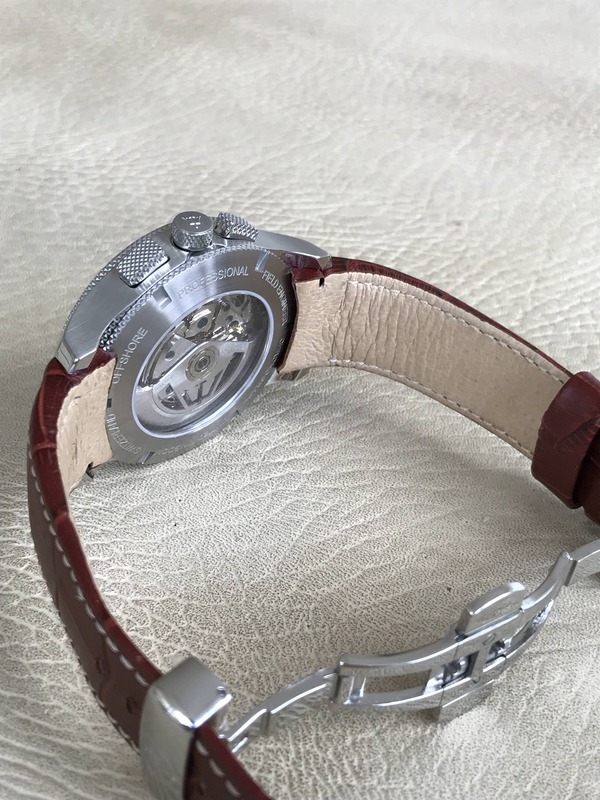 It has a little of the classic ‘Valjoux wobble’ although interestingly it’s far less noticeable in the Field Engineer than it is in my Breitling Navitimer World (the movement in that being based on the 7754). I have no idea why, although my guess would be that it’s to do with the case construction damping down the oscillations somehow (Lorne has already put his engineering hat on and weighed in with a technical explanation on the other thread). The watch is currently running at +2 seconds – if it stays at that I’ll be well pleased. The chrono pushers operate with a crisp, tactile click, as does the crown. The sub-dial hands hit their markers precisely and the chrono hand snaps back to Top Dead Centre perfectly – the whole watch feels beautifully engineered. 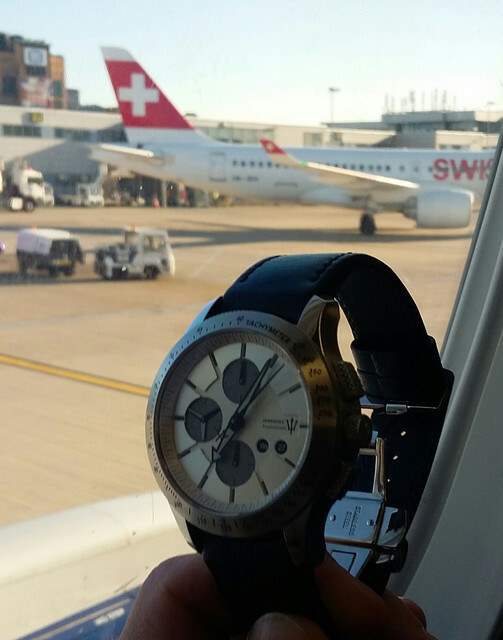 The watch wears well, with a 44mm case diameter translating into 53mm lug to lug. 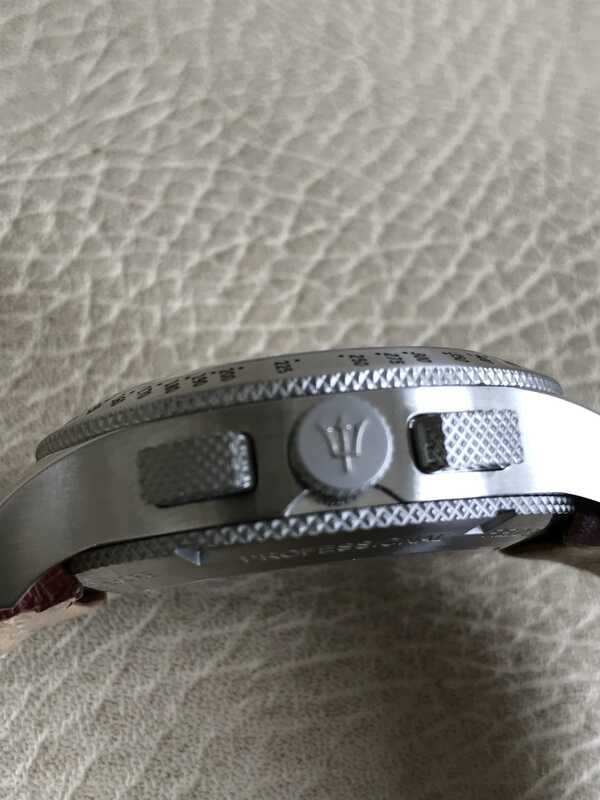 To some that may seem big, but due to the downturned lugs it’s very comfortable and the use of the supplied deployment ensures that the watch head sits perfectly on the wrist. In truth, I like big watches anyway and if it had been any smaller I probably wouldn’t have bought it. I can’t comment on the steel bracelet as I’ve not put it on, but it appears to be solid and well made, and it’s built in 5 rows of links, alternating brushed and polished. 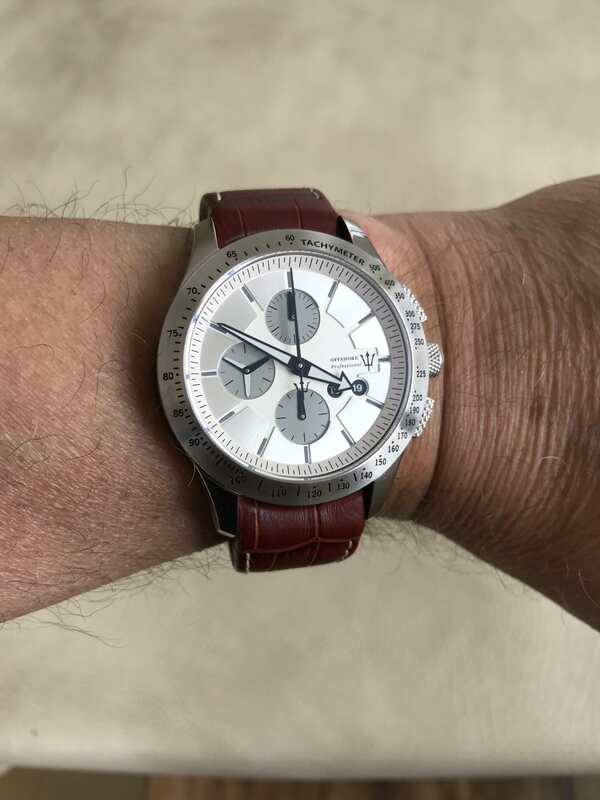 It’s a nice touch and a feature shared with the bracelet on my Doxa Sub 1500t – it looks great and ‘lifts’ it so that it doesn’t just seem like one uniform mass of metal. 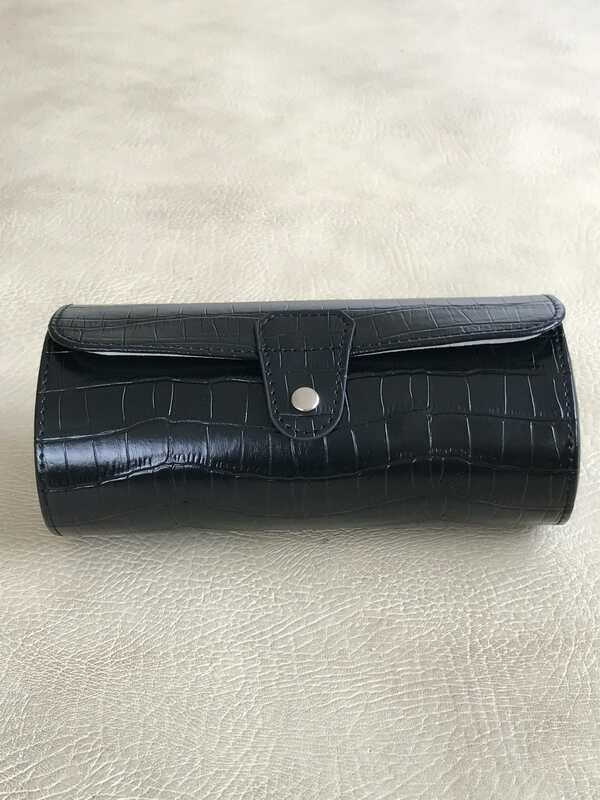 The OE black leather strap with black stitching is curved end and fits the case perfectly – I know this because it’s the same basic construction as the Hirsch Principal that I have on mine. 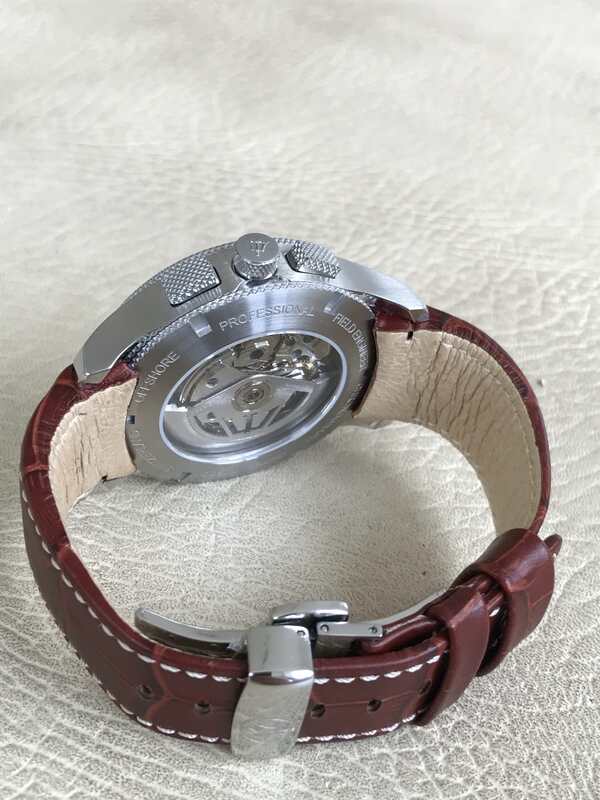 Having the Field Engineer on the brown Hirsch strap was a personal choice for me prompted by the fact that it’ll fit better into my collection rather than being on a black strap. 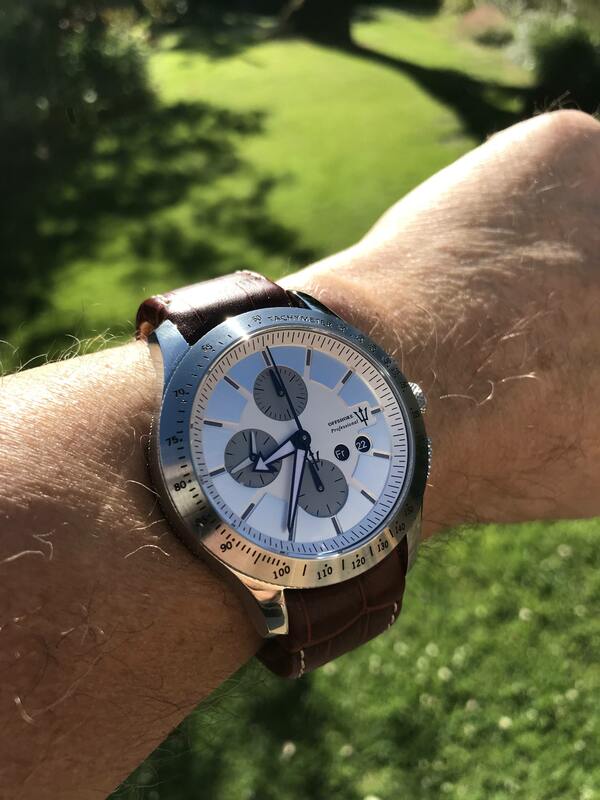 I’m pleased I did it – it works brilliantly with the case and dial and I love the fit, quality - and the colour is awesome. I also prefer contrast stitching to matching. I hope you’ve enjoyed reading these reflections and checking out the photos (I’m not in Johnny E’s class as a photographer - Johnny built Lorne’s new website for him - but they’ve come out pretty well, I think). More to the point, I hope it may inspire some of you to go to the website and consider one for yourself – I’m not on commission but I can’t recommend this watch or Lorne highly enough. 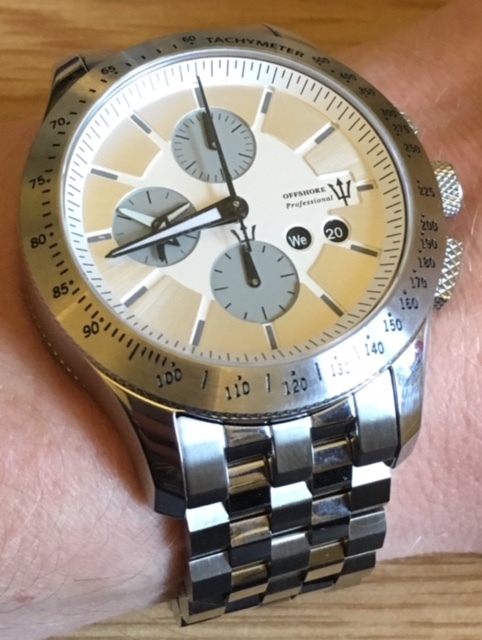 How often does the owner of a watch manufacturer phone you up from his car to tell you how pleased he is that you’ve just collected one of his watches?! Last edited by mycroft; 27th June 2018 at 20:35. Very nice and certainly different Simon. When I looked at the dial I was reminded of the late 1950s early 1960s styling and design that you see on furniture and everyday items from that period, a sort of early (Sputnik?) space age feel to it. The matching pattern of the metal on the top of the pushers, around the crown and around the top and bottom of the case is really effective. I also like the day and date holes, a lot different to the usual traditional square. A brand that I am not overly familiar with, but it looks a well built bit of kit and the customer service seems really impressive. Thanks Ares. You probably won’t be surprised to learn that I haven’t taken it off since I picked it up! Last edited by mycroft; 21st June 2018 at 20:24. Very nice and certainly different Simon. You seem to have had pretty much everything else out there, Ken . Perhaps you should give one of these a try - they’re phenomenal value for money in my opinion. You seem to have had pretty much everything else out there, Ken . Perhaps you should give one of these a try - they’re phenomenal value for money on my opinion. No, don't Simon, must resist. I have put myself on a sort of rehabilitation. I'm in for the first of the new batch, more expensive, cause I dallied. But hey it's a hefty chunk and rarer than most others. I keep coming back to this thread Simon. 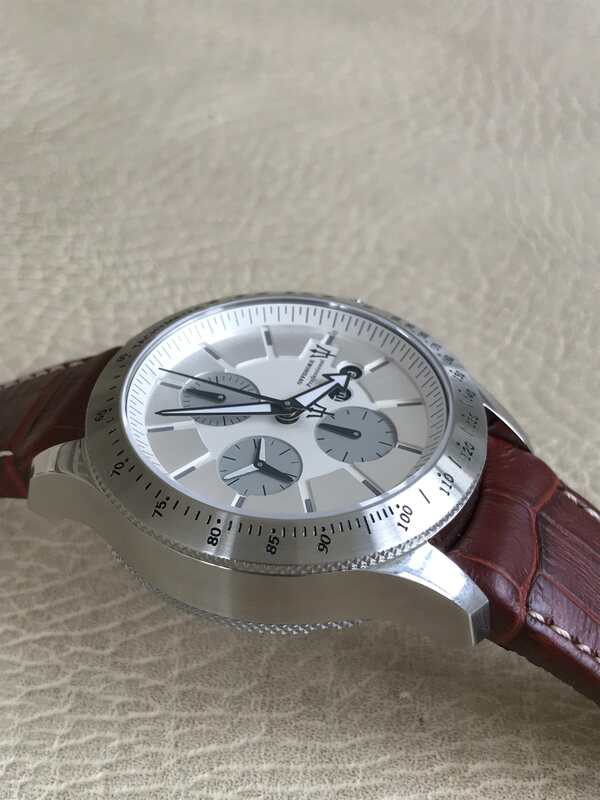 Its a very appealing watch, I think I would like the size especially as the knurling would help to hide it somewhat (in my head anyway, not sure in reality). 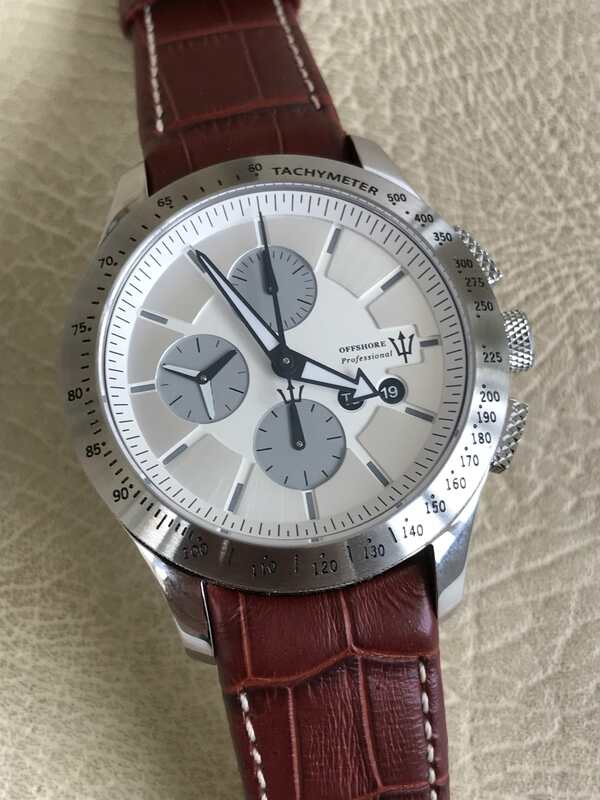 I have had a look at the website and it appears there is only one dial design, is this in continuous production or are they amde in batches? Have you tried the bracelet, I really like the design, it must have quite a bold tool watch look to it on the bracelet. It is a single design, yes, although I think Lorne ultimately has ambitions for more than one. It's hand-built to order (part of it's appeal), so typically delivery is between 2 and 8 weeks - he quoted me 8 and delivered it in 3! I've not tried my bracelet yet but Dariusz (the watchmaker who builds them) wears his on the bracelet and I've tried that one - it's great. I love this pic that Lorne took. One thing that's interesting - the screws I've had before on bracelets are threaded on one end only. These need a screwdriver on BOTH sides from what I can see. The screw, screws into a receiving screw on the other end if that makes sense! Means that the bracelet itself (or rather the links) can never get cross threaded or stripped. 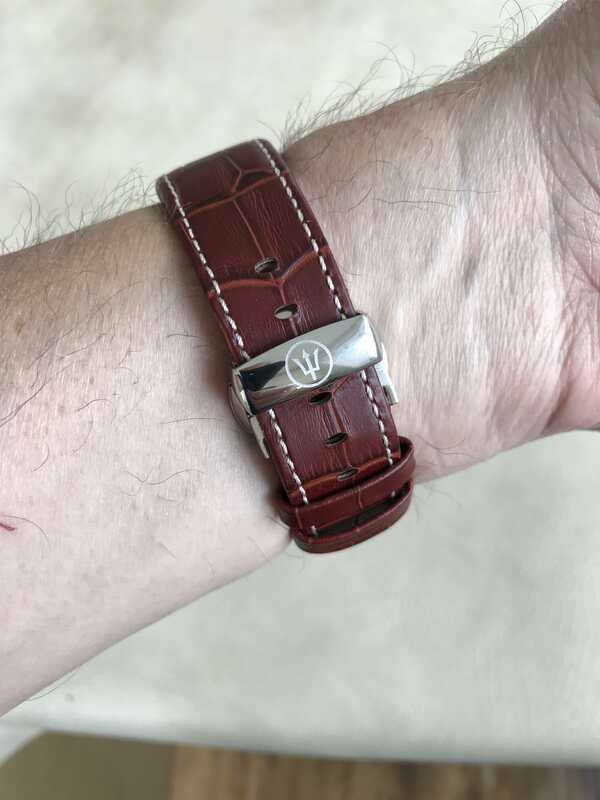 I put the bracelet on mine to try it out, good things are the links are all half length so you can get a fairly good adjustment although there is no smaller adjust on the clasp and no micro adjust. I found a size where there was a little slack so felt like it'd be fine on a hot day, but the watch didn't move around at all so for me that's perfect. I ended up putting it back on the leather, but will probably swap over from time to time. The leather straps are fully waterproof and robust, Hirsch Leonardo on mine but that's been discontinued so an alternative strap is in the works. 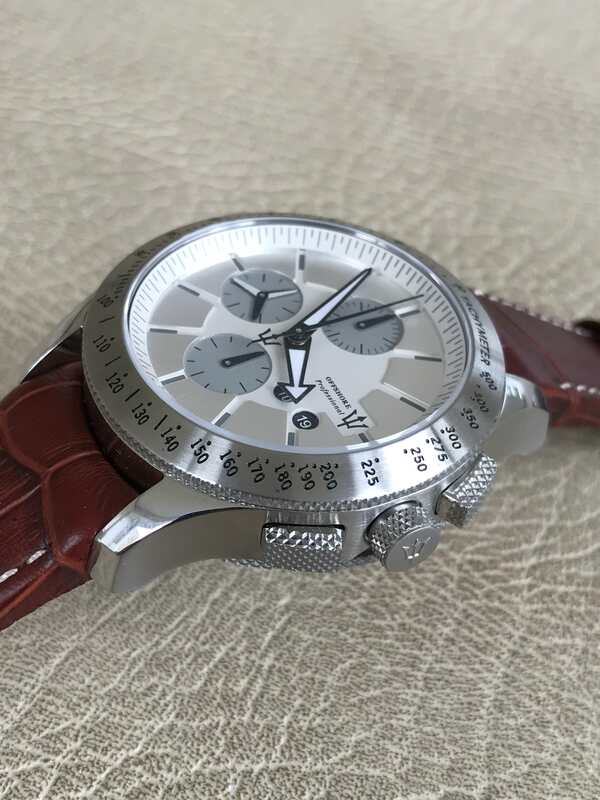 Great watch, great design, nice individual-looking dial, and impressive specification. I love what Lorne has done and wish him every success. I just cannot get on woth the knurling on sides of the pushers. The pushers are longer nearer the crown, and curved, so the knurling is cut through at differing points over the length and there is a varying length of un-knurled pusher, and to me it just looks a little bit wrong. For me, perhaps, I think the tachy bezel edge, the crown, the caseback endge and the ends of the pushers would be enough knurled facets. So perhaps the sides of the pushers could just have a small chamfer to cover the edge of the knrled ends. It is a small thing, and perhaps only visible at the scale of magnification seen here on screen (rather than at life scale), but it is one of those details that is hard for me to un-see now that my eye has been drawn to it. I tried to edit that thread title over on the other thread... but you've only got one week to change a title. Got myself some macro equipment last week... so I'm hoping to do Lorne some close up 1080p video for the site. One thing I really LOVE is the 3 pronged second hand at 9 o'clock. It really does just glide... and has a lovely effect, like a smooth running propeller. 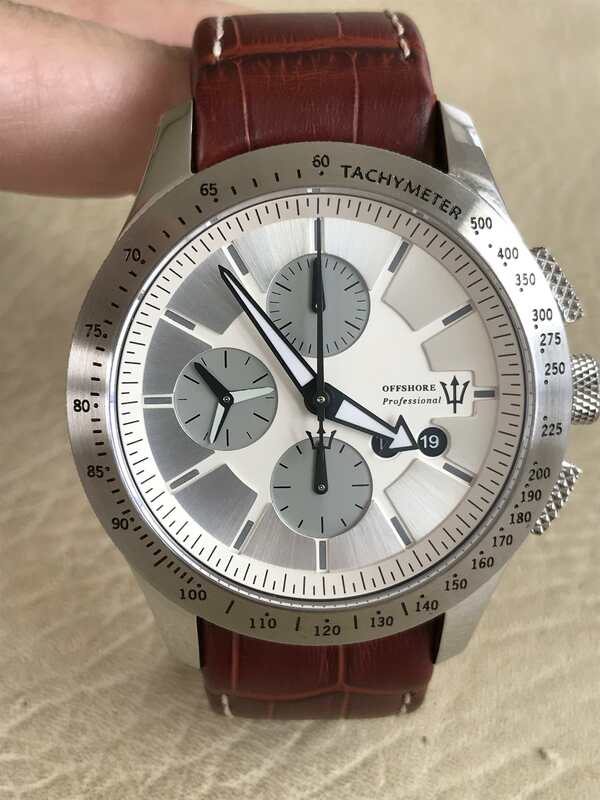 It is a design that is growing on me, I would really like to see one in person to fully appreciate the dial. I really like the bracelet design and the double ended screw design is a bit fiddly but it is done for a good reason. I think my photos and Johnny’s do a pretty good job of showcasing the watch, but if you get a chance to see one ‘in the metal’ then do take it - it’s a mesmerising dial. The double/ended screws are a bit scary but if you’re careful it’s not that difficult to resize the bracelet - and as you say there are sound technical reasons for the design. I watched JohnnyE's video for the full minute before I realised I was watching the fan hand going around in a video when I had a real one sitting on my wrist! Few days in europe this week so took the opportunity to visit one movement manufacturer today to discuss modifications I'd need for it to work in the next model chronometer. Better solution to have them done at source rather than the Field Engineer's 775M2 which is modified in London. As always, I light up every airport metal detector like a christmas tree thanks to the leg repairs, except the one at London City on the way out. Told the chap his machine was broken. See attached. Luckily Lorne is sorting it out. I adore the watch and with Johnny's bracelet photos it changes from classy dress watch to rugged tool watch. I still haven’t tried the bracelet, Mick - I just love my watch/strap combo too much to change it! I was just amazed at yours vs this "new" strap. So a few more weeks on, you still loving it Simon? I've been looking at these with interest. A very nice review, thanks! Still very happily wearing 134. 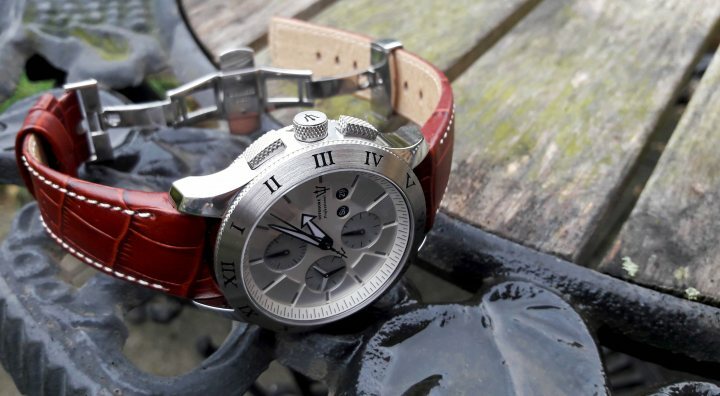 Marvellous watch, stylish, substantive, functional but does not wear too heavy. Thanks for the review, I have found reading this and the other Offshore Professional thread fascinating. Have now spent quite a while on the website as well. Is that the new strap? It looks very good. How are you getting on with it? In fact the reason I’ve not been on the forum for a while is that we’ve been in Portugal on holiday... and the Field Engineer was one of the two watches I took with me. Putting it on continues to give me a frisson of excitement (steady there...) and more and more I see it as a total keeper. What excellent taste you have, Sir! Strangely enough, I thought that when I saw yours! It's the new strap but being swopped for another as we speak. 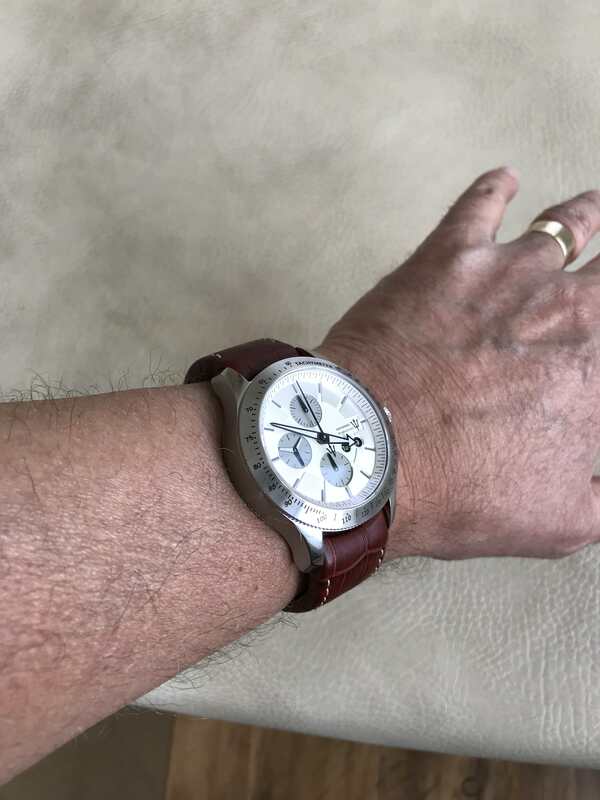 The Field Engineer chronograph is NOT diver rated, but since they're built and tested to a decent pressure resistance I thought I'd strap mine to the wrist of a commercial diver for an 8 hour stint in the sea. His instructions, other than those for the job in hand, were not to push the buttons, play with the crown, or basically do anything except tell me every once in a while if it was still running. Fresh water wash and quick clean afterwards and back onto my wrist. Mine complete with new strap due back at the weekend or early next week. But wears well in all circumstances. Will let you know how the new strap wears. 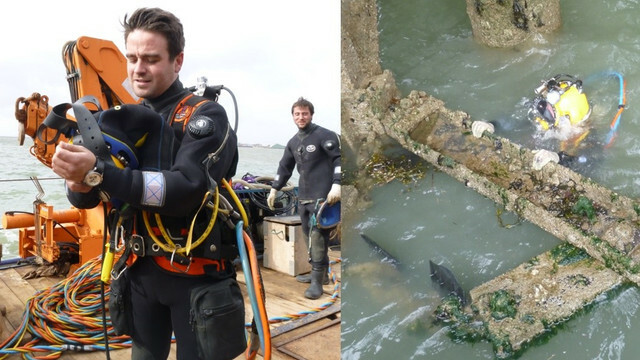 So swimming in the pool or the sea is a walk in the park for a Field Engineer Lorne! Swimming pool, or probably more accurately, the pool side lounger, is the ideal location for a Field Engineer. Be it the chronograph or the chap wearing it. Yeah.... Have to fully agree with you there! #130 is on a dangerous9 Teju as of today. Quality is like NOTHING I've seen or handled. Soft to the touch. Perfect curve with zero wrist gap. The blue inner is gorgeous... A perfect colour match to the blued movement screws. Yes does deserve better shots, which I know you can do, but I can’t be bothered my Nikon D7000 is dead. Batteries need charging spare and camera. I have no way to add them to the forum unless I pffaff around with Dropbox. I leave the arty stuff to those who want to do it.